Over the last few years the architectures of ARM processors have been substantially upgraded by adding cores, instructions and faster pipelines, increasing their performance. Embedded continues to stand for low cost and low power consumption but it does not mean low processing power anymore. A wide range of Embedded ARM processors are available now, Embedded ARM processors are often incorporated into systems on a chip for vision applications. 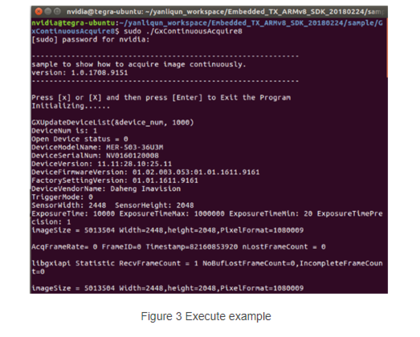 To run on ARM platform, DAHENG IMAGING provides ARM Linux SDK for USB3.0 camera. 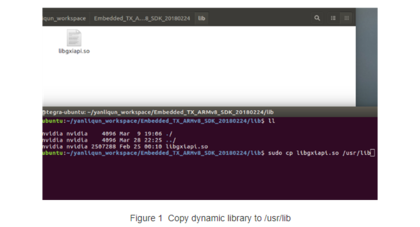 a)Copy the dynamic library named “libgxapi.so” to /usr/lib directory. Each example program directory includes a makefile for compiling the example. Each example must be compiled before executing it. You can use 'make' command to compile the program in the example directory. After compiling the program successfully, you can run the program in the current directory. But it is worth to be noticed that you must change user permission to administrator for executing the program. Using 'sudo ./' command to execute the program in administrator mode. If the 'GxContinuousAcquire8' program run successfully, some texts will be printed as following.